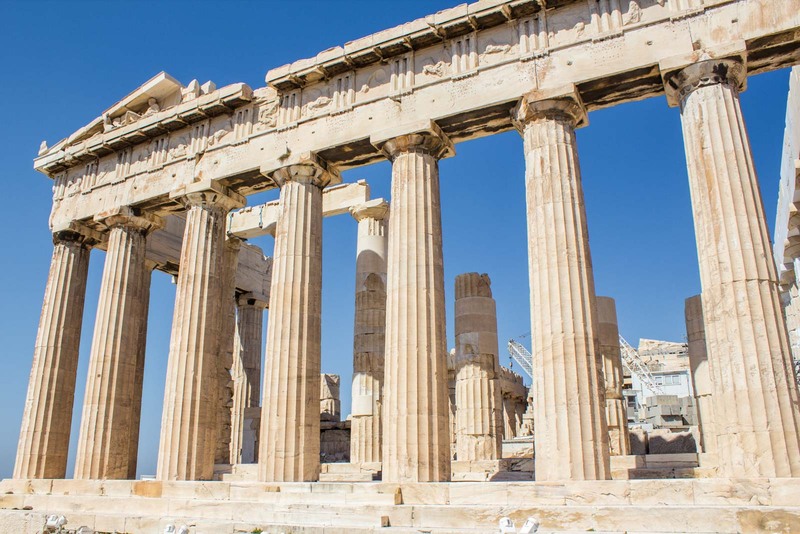 The Acropolis and Parthenon in Athens Greece: Acropolis Wow! It’s always a bit strange, I find, actually going to one of the world’s most famous landmarks. There’s so much expectation there. You’ve seen so many photos – often making the place look better than it could ever be in real life – that you fear the actual thing couldn’t possibly live up to the hype. I was worried the Acropolis in Athens would be one of those. Climbing the steps, it is hot. A steep cliff rises above me, a scattering of ruins lies around. Nothing to write home about yet. Tourists are paused along the path, taking photos of… I’m not really sure. One Japanese visitor is told off by the guards for using a tripod but I’m not really sure why. There’s no need for him to be using the assistance to photograph the unmoving objects in the hot sunlight – so there’s no real point in stopping him. But so be it. I walk further on and leave him to his sweaty mutterings, imagining speech bubbles of angry kanji characters. Up the final set of stairs it’s starting the get slippery. Climbing on marble in flip flops makes you wonder if the stones are perspiring themselves. Perhaps it’s the strain of supporting so many visitors over so many thousands of years. I imagine it’s always been tiring, even if the material of the sandals have changed over the generations. Getting to the top, I pause for breath. Not because of the steep incline I’ve just climbed, but because the beauty of the Acropolis has finally revealed itself. Everything that had been visible from a distance is in front of me but close up it takes on a new dimension. I had wondered if it would live up to expectations. It does. The columns tower above, the scale something that could not be imagined. Unlike many ruins in Greece, it’s easy to picture the original form. 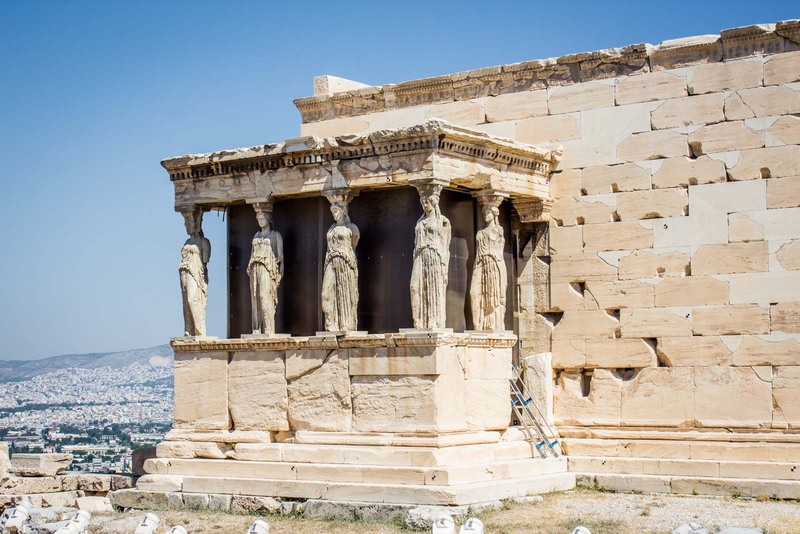 The temple for Athena is a tribute which merges the human and the divine. All of Athens, her city, lies flat below but up here, closer to the heavens, you feel displaced from the minutiae of everyday life. There is a spirituality to standing atop the Acropolis that neither time nor cynicism can destroy. It seems even hotter up here. Are we closer to the sun? Is there a reflected heat from all the stone? Is it just a lack of shade? Under one of the few trees on top of the hill, bubblers of water allow visitors to quench the thirst and refill their bottles. One family has commandeered them all, though, like foreign invaders conquering and hydrating. Their small children use it as a bath, splashing around in the shallow basin. 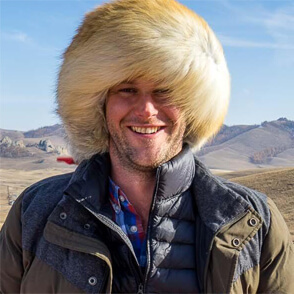 Really, it’s not that hot! And it’s my turn! It’s funny how the grandest of sites can be so impressive, despite the expectation. The most religious of places can be almost transcendental. But the little things somehow always creep in. A ban on tripods; slippery stairs; a queue for the drinking water. We are but mere mortals. Beautiful pics…really need to make it to Greece, before they have to sell off the country..
Yeah, it’s quite a stunning place – from every angle! love that night time shot, what a great photo. Thanks. I had to get high up on top of a mountain to get it. 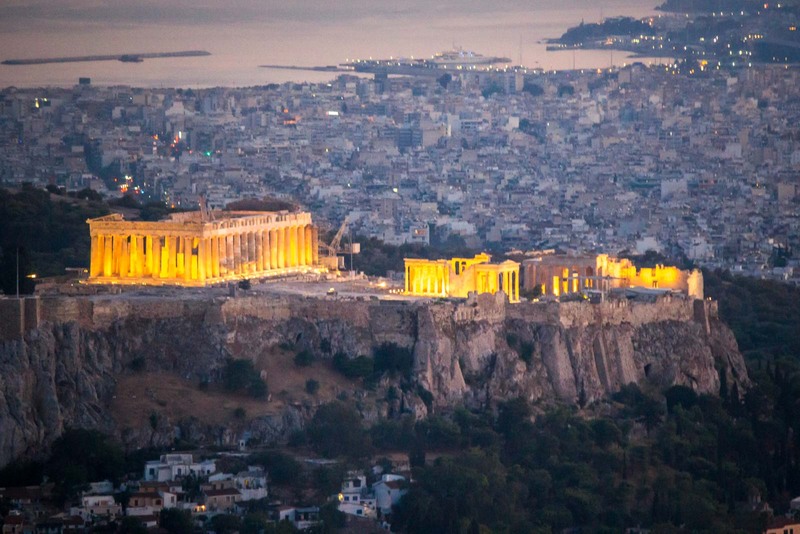 Not much else is higher than the Acropolis in Athens. My first thought when I reached the Parthenon was like: why are there cranes here? It doesn’t look like its pictures in the postcards 😀 I had to spend over an hour there to really appreciate the beauty that is Acropolis. Yeah, it seems like there is constant construction (restoration) work going on there. It does take away from the mood slightly. I wonder whether they’ll ever be finished? An amazing part of history so perfectly displayed for the current generation. I often wonder with this ruins, what people will think about them in say 300 years time. Fantastic photos, so much history enshrined in those ruins. I think the Acropolis very much lives up to the expectations. Even on hot summer days with heaps of tourists, it’s quite possible to imagine how it once was. Wow – that’s pretty hilarious! Not what you would expect at all at the top of the Acropolis. But a pretty unique impression (I assume). That second photo is gorgeous! And we know what you mean about fearing that reality will not live up to the hype. We felt that way about the Taj Mahal, then it turned out to be so much MORE than expected that we visited it on two different occasions! That’s great to hear that about the Taj Mahal. I haven’t been there yet but would have the same kind of concern. To be fair, there aren’t a lot of places that do disappoint… but there’s just always the fear that they will. Beautifully written post about a beautiful spot that I really want to visit. I had high expectations for the Pyramids in Egypt. And they luckily blew me away. I’m pleased to hear that about the pyramids! I’m sure you won’t be disappointed with the Acropolis either. I’m sure I’ll always remember going to The Acropolis but I probably won’t always remember the family who were hogging the water. 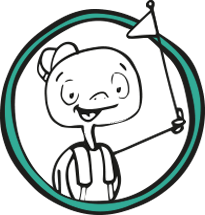 The small things aren’t important, as such, by they are part of the experience. I’ve been there a few times but I still love it. I personally love the view of the acropolis and agora from the aeropagus. I can just imagine the cases being heard and Paul’s sermon as well. 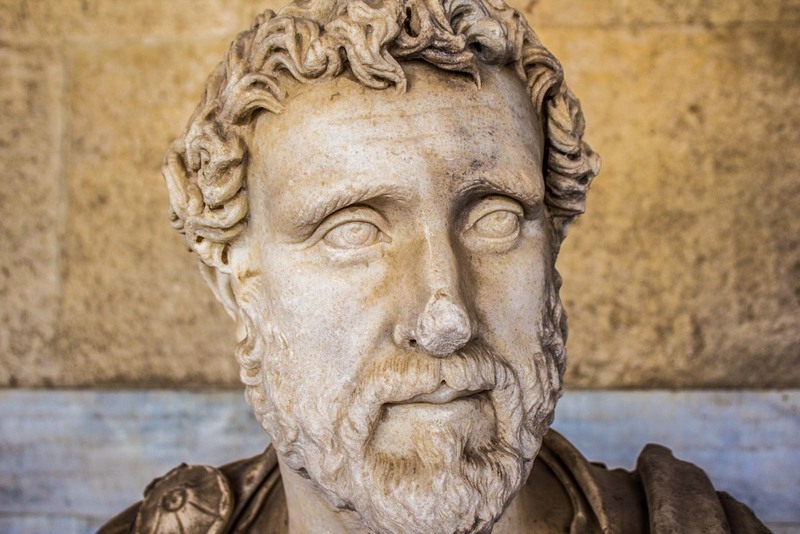 And your photos are gorgeous, but I recognize that bust of Antoninus Pius from the Stoa of Atalos in the agora. Definitely go earlier in the morning to the Acropolis. I think I was up there before 10 and although sunny and warm, not insane like you talk about. Really is an impressive place though. What commanding views over the city. Years later, we still admire the beauty of this place. I can only imagine the awe that this place inspired when it was first built and fully functional. Gosh, when it was all intact and not the pile of ruins it is now, it would have been an incredible place. 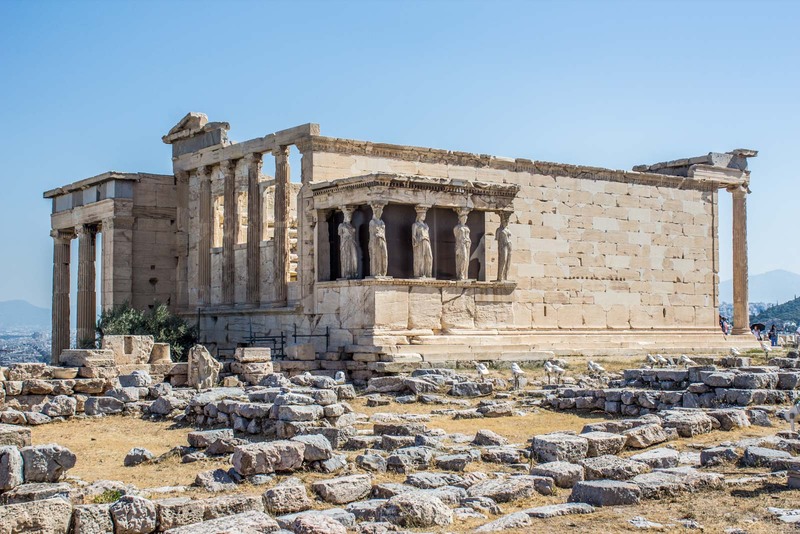 Especially considering that Athens would not have been nearly as big as it is now – it would have just added to the impact of the temples up on the hill. 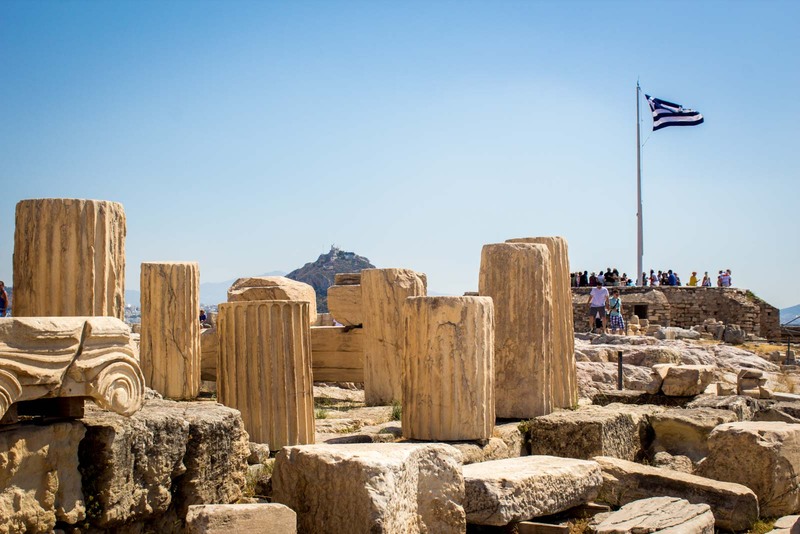 Interesting angle on stating the pros & cons of the Acropolis. I’m glad to read that it’s worth all of the hype. It’s beautiful with the night lights, isn’t it? And – more importantly – it’s not nearly as hot as it is during the middle of a summer day!! 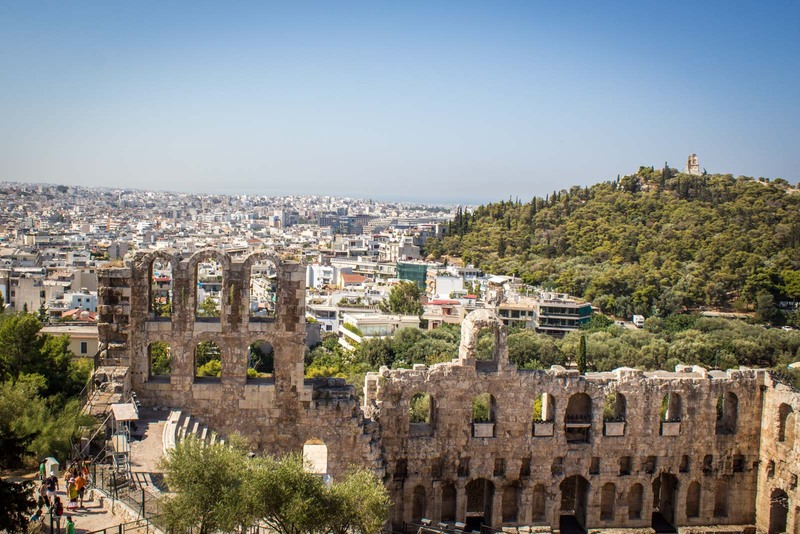 You really captured the Acropolis experience beautifully in this post. It is certainly one of those places that everyone must see at least once in their life. Great photos! Oh yes, indeed. It really is one of the most important places in the world and you have to try to see it once, don’t you? You take really beautiful shots! 🙂 Despite the crowd, I think Acropolis is so quintessential you just have to do it. But the ticket also comes together with a visit to Ancient Agora (it’s like Acropolis without a crowd) and Kerameikos (very underrated, the archaeological site is themed around death). I love Greece and would like to return someday! A great point! 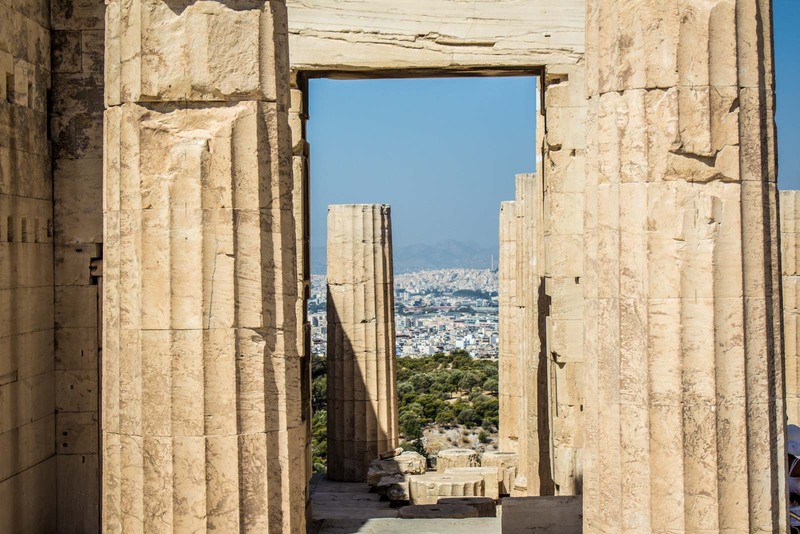 You’ve got to see the Acropolis when you’re in Athens but it’s also really worth using the ticket to visit the other places that are included with it.